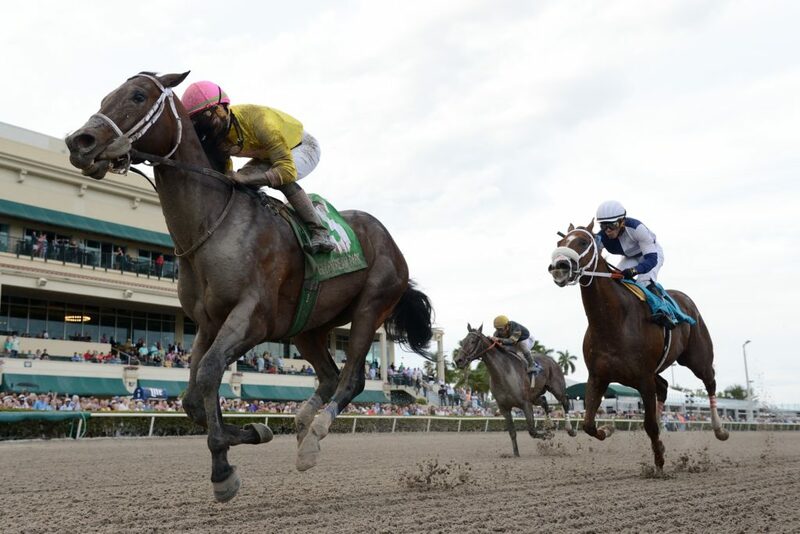 HALLANDALE BEACH, FL – The Kentucky-based duo of Harvey Wallbanger and Everfast accounted for a $1,101.70 payoff for a $1 exacta in Saturday’s $350,000 Fasig-Tipton Holy Bull (G2) at Gulfstream Park. The Kenny McPeek-trained Harvey Wallbanger parlayed a ground-saving trip under Brian Hernandez Jr. into a 29-1 upset victory by a length over the Dale Romans-trained Everfast, who went off at 128-1 and edged odds-on favorite Maximus Mischief by a neck. Harvey Wallbanger came into the Holy Bull off a maiden victory at Churchill Downs that followed a trio of seconds in his first three starts. Everfast won an Ellis Park maiden race in his debut last summer. He was ridden in the Holy Bull by Chris Landeros. The Holy Bull, a 1 1/16-mile prep for 3-year-olds, headlined a 12-race program that also offered the $150,000 Swale, a seven-furlong stakes for 3-year-olds, and the $150,000 Forward Gal (G3), a seven-furlong stakes for 3-year-old fillies. 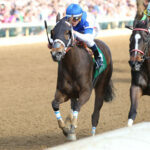 The Holy Bull will be followed by the $400,000 Xpressbet.com Fountain of Youth (G2) March 2 on the Road to the $1 million Xpressbet.com Florida Derby (G1) March 30 at Gulfstream. Harvey Wallbanger was making his stakes debut in the Holy Bull while racing for the first time this year. In his most recent start, the son of Congrats captured a maiden special weight race at Churchill Downs Nov. 17 after starting off his career with three straight second-place finish for owners Harold Lerner LLC, AWC Stables, Nehoc Stables, Scott Akman and Paul Braverman. Maximus Mischief, the 3-5 favorite in a field of nine, suffered his first loss in four starts while finishing third, unable to withstand the inside challenge of Harvey Wallbanger after gaining a lead in the stretch. “It’s a horse race. You can’t duck one, can you? He showed he had some good, solid ability. I was thinking he’d rise up to whatever level you put him in,” McPeek said. “All we did last fall was really kind of teach him what to do. The end of the season he was a little tired after his fourth race and we backed off, came down here, and took our time. Hernandez, who has enjoyed solid success during his first Championship Meet at Gulfstream, executed the plan to perfection. Harvey Wallbanger was rated far off the early pace set by Epic Dreamer, who showed the way around the turn and along the backstretch while posting fractions of 23.18 and 46.76 seconds for the first half mile. Maximus Mischief, who captured the Dec. 1 Remsen (G2) at Aqueduct in his most recent start, broke from the gate sharply under Jose Ortiz and was in closest pursuit of the pacesetter. Epic Dreamer, a 12-1 longshot ridden by Irad Ortiz Jr., continued to show the way on the turn into the homestretch, when Maximus Mischief was asked for his run. 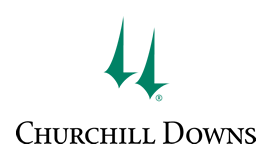 The favored son of Into Mischief advanced on the leader to gain the lead in the stretch but was unable to hold off Harvey Wallbanger, who skimmed the rail to win by a length, and the late outside surge of Everfast, a 128-1 outsider who grabbed second by a neck under Chris Landeros. Epic Dreamer faded to fourth. 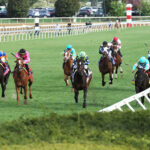 Mihos, who captured the Mucho Macho Man at Gulfstream Jan. 5, finished fifth after stalking the pace. Ortiz said the Robert (Butch) Reid Jr.-trained Maximus Mischief didn’t seem to be running to his ability. The trip made the difference for Harvey Wallbanger. Harvey Wallbanger ran 1 1/16 miles in 1:43.69 while giving McPeek a second Triple Crown prospect. McPeek also trains Grade 2 winner Signalman, who breezed at Gulfstream Park Saturday morning in preparation for a start in the Fountain of Youth.